Internally it has two main areas which can be viewed at any time by removing the front panel (see figure 1). The hole at the bottom provides the entrance and allows droppings to fall out. The box requires no maintenance or cleaning. 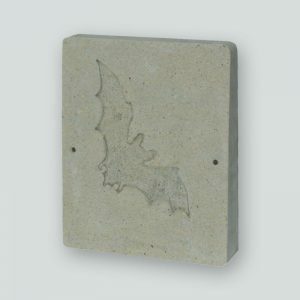 Bats search for and inhabit spaces which suit their own particular habits and requirements; their differing preferences have been carefully reflected in the design of this product. 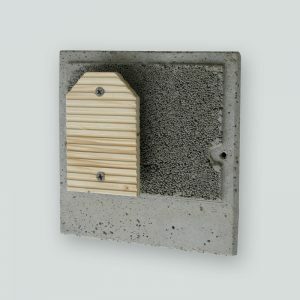 For example, the outside of the front panel has been roughened to enable the animals to land and hang on to it securely (see figure 2), and access is via a step-like recess to ensure that even inexperienced young Bats quickly become accustomed to it. Interior: Inside there are rough pieces of wood incorporated into the back of the box which are good insulators and are used by the Bats as perches, and the inside front has a special porous coating which helps to maintain the ideal temperature inside the box. The internal layout means that there are three different areas from which Bats can hang and which offer different degrees of brightness and temperature. There are also non-slip areas, gaps ranging from 1.5 to 3.5 cm in width, and places to hide (see figure 2). 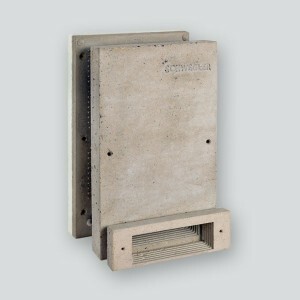 Material: The box is made of special weather-resistant, air-permeable and rot-proof SCHWEGLER wood-concrete. Because this material is so long-lasting, and because the design of the box prevents water entering (see ­figure 3), the box will help Bats for decades. The front panel is painted ­during manufacture; if you wish to match an existing colour, it can be painted with an air-permeable wall paint. Note that the rear has been left untreated to provide better contact with the mortar if it is installed within the rendering on an outside wall. All metal parts with which the animals come into contact are made of rustproof material. 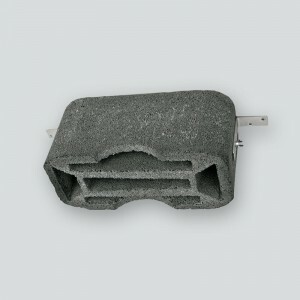 Installation: Using the four screws and plugs provided (see figure 1), the box can be easily attached to most types of external brick, timber or concrete walls (see figures 3 and 4). It will also attract Bats if it is placed inside a roof space or inside historic buildings. When it is fixed to timber we recommend that the gaps between the wall and the box are sealed with silicone to prevent moisture being trapped. 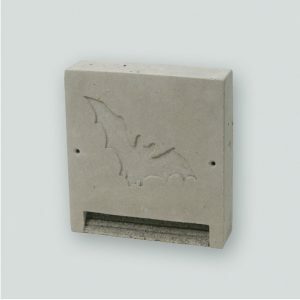 Installation height: Position 3 metres or higher above the ground in a place where there is a clear flight path for Bats entering and leaving the box. Dimensions: width 35 x height 60 x depth 9 cm. Includes: Bat Box, screws and plugs.